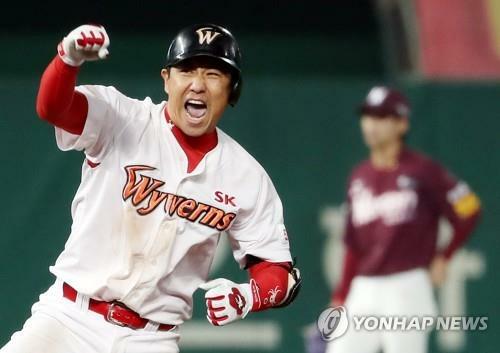 INCHEON, Nov. 3 (Yonhap) — SK Wyverns’ veteran outfielder Kim Kang-min wasn’t supposed to play much in the team’s Korea Baseball Organization (KBO) postseason, let alone get into the starting lineup. But one man’s misfortune became another man’s opportunity. The usual starting outfielder, Ro Soo-kwang, sustained a finger injury late in the regular season, and that opened the door for Kim, 36, to step in and take both the center fielder and leadoff job for the series against the Nexen Heroes. And it turned out to be a huge gain for the Wyverns, too. They eliminated the Heroes in five games, after a dramatic 11-10 win on Friday, and Kim was voted the series MVP after batting .429 (9-for-21) with three homers and six RBIs in five games. He earned 40 out of 65 votes from the media. In the clinching game, Kim went 3-for-6 with two RBIs and three runs scored, and launched a game-tying solo shot to open the bottom of the 10th inning. Han Dong-min’s solo shot immediately afterward won the game for the Wyverns. During the regular season, it was Ro, 28, who took away playing time from Kim and limited the veteran to 80 games, Kim’s lowest total in 13 years. Kim also spent a couple of months early in the season in the minors. One of the few remaining players from the Wyverns’ last championship team in 2010, Kim gradually became a forgotten man. But he returned to the spotlight with a bang in this series.